“Have you ever seen the Moon,” asked a professor, ironically, of one of his pupils. “No, sir,” replied the pupil, still more ironically. “But I must say I have heard it spoken of.” (From Jules Verne’s novel All Around the Moon). Let’s then speak of the Moon, just as the science fiction author Jules Verne. 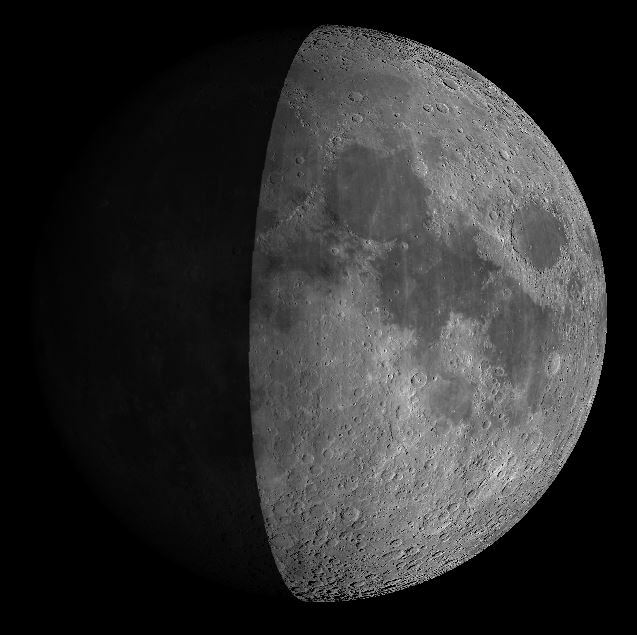 This weekend, the Moon will be in it’s first quarter – meaning we will have a waxing Moon. Now our only natural satellite is excellent to observe. The Moon craters will be illuminated from the side and offers observers an excellent contrast, especially along the day-light line, the Terminator. There are regions, which belong in the must see category this weekend. Already at dusk, the Moon will be visible high in the southern sky. The best view, however, will be around 10 PM, at which time it will be pretty dark. A delicacy for the naked eye will be the close encounter between Jupiter and the Moon, because they will appear at a distance of only 5 degrees from one another. The brightest objects of the night sky will then be unified. If you look at the Moon with a telescope, you will be rewarded with a fantastic vista of thousands of craters. No other celestial object can be seen in such great detail with amateur telescopes. The Moon’s short distance to Earth at 384,000 km (238,000 miles) and diameter of 0.5° ensures such a great sight. Even those with little, beginner telescopes from 60mm diameter, can view the Moon in an amazing detail. This weekend, there are yet a few special tidbits, which we have picked out. The Alps aren’t only to be found on Earth, but rather on the Moon. In its current phase, these mountains are located close to the Terminator in the north. They stretch over a distance of 300 km (186 miles) and border northeast of the Mare Imbrium. The numerous hills and peaks reach a height of up to 2,500 meters (8,200 feet). However, you will find no cabins on these mountains. The Lunar Alps still await the first summit by humans. Mont Blanc is at 3,500 meters (11,500 feet) is the highest peak in the Lunar Alps. You can find it in the middle of the mountain range. With 100 magnification, you can survey the Alps with high detail. 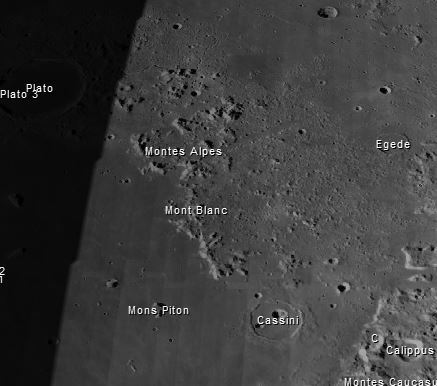 Especially excellent to observe is the lunar valley – Vallis Alpes. An enormous trench with a width of 15 km (9 miles) works its way through the entire range, much like a Grand Canyon. From its edge, it leads down 1000 meters (3,300 feet) into the depths! With a 6“ or 8“ telescope, you can recognize another groove at the floor of the trench. Good night conditions and a magnification of 200 are requisite. Let’s direct our gazes towards the middle region of the Moon, where we will see a little worm that winds across the moon. The lunar rille Rima Hyginus can be found south of the Apennines and west of the Mare Tranquillitatis. This groove, presumably, formed as a result of volcanic activity. These days it is a much loved sight for observers. 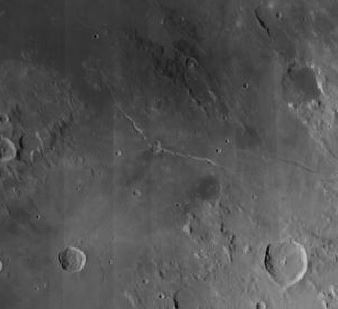 The Rima Hyginus stretches in length to 220 km (137 miles), but only has a width of 4 km (2.5 miles). 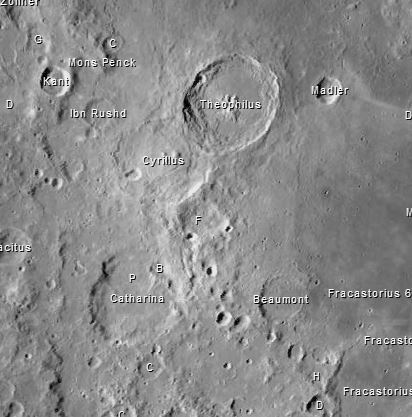 In the middle, you can find the crater Hyginus, itself, a sunken crater with a diameter of 10 km (6 miles). The noteworthy feature is observing a cone-shaped light ray in the crater as the moon reaches 7 days old. Similarly, as with the Hesiodus Lunar Ray (see our blog post). West of Hyginus, you can find a row of smaller sister craters. A diamond in the rough is the chain of craters west of the Mare Nectaris. The striking craters Theophyllus, Cyrillus and Catharina create a semi-circle, of which Theophyllus is the most noteworthy. It has a diameter of about 100 km (60 miles) and its walls rise up an incredible 6000 meters (almost 20,000 feet)! In the middle, you can see, even with a small telescope, the central mountain, comprised from the three peaks Phi, Psi and Alpha. The other craters are of similar diameter, but are starkly worn. A gaze at the trio is most certainly worth the effort. You can observe the Moon pretty well with almost every telescope – refractor or reflector – and refractors with long focal length are especially useful. 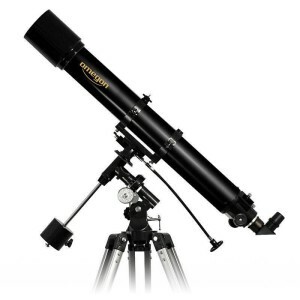 A perfect telescope for beginners is the Omegon AC 90/1000 EQ-2. Its focal length and aperture ratio of f/11 delivers an image with few color distortions. Additionally, you can really enjoy high contrasts with this telescope while observing the Moon. An even better telescope is an Apo, such as the Omegon APO 127/952 ED Triplet. Such a telescope offers fantastic contrast during lunar observations. However, even Maksutov telescopes offer excellent contrast. The advantage here is that they are light, transportable and are great to take on trips. If you are looking for such a telescope, check out our MightyMak Telescopes. Color filters in sizes 1.25″ and 2″ help you increase contrast when observing the Moon and planets. With lower magnifications or with larger telescopes, the Moon can be blinding. In order to allay the light of the Moon and simultaneously increase contrast, you can use a Neutral Density Filter, available as a Variable Grey Filter or in various grades. 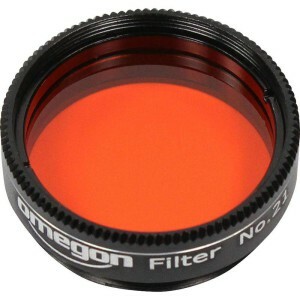 For 2″ oculars, we offer, for example, Omegon Moon Filters with 50%, 25% or 13% transmission. However, you can use color filters to increase contrast. The green, orange and bright red and yellow filters are excellent. Color filters are available as complete filter sets or individually in the sizes, 1.25″ or 2″.